More than 800 homeless veterans and their families are expected to participate in the 31st annual Stand Down intervention that began Friday. Sponsored by Veterans Village of San Diego and supported by California Senate President Pro Tem Toni Atkins, the three-day event provides a variety of supplies and services, including food, shelter, clothing, hygiene care, health screenings, VA benefits counseling, employment guidance, substance use treatment and mental health counseling. 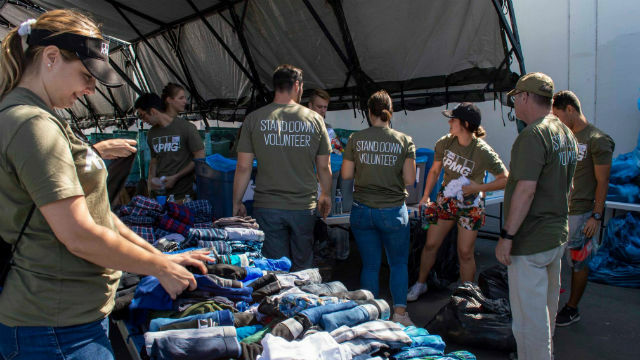 “For our veterans who have lost everything and are living on the streets of San Diego, this year’s Stand Down, coordinated by VVSD, will once again provide an opportunity for them to access services, connect with the community, restore hope and allow them to ‘Stand Down’ for a weekend,” said Veterans Village President and CEO Kimberly Mitchell. Veterans are also provided access to housing acquisition services. Ultimately, many participants are inducted into Veterans Village’s Veterans Rehabilitation Center, a residential program for homeless veterans battling alcoholism, drug addiction and emotional trauma. “Stand Down is a place of miracles, if you believe in such; a place where a veteran suddenly thrust into homelessness can find an immediate solution and the same place where a chronically homeless person for more than 15 years can find a transitional place of recovery, treatment, education and training,” said Darcy Pavich, Veterans Village chaplain and Stand Down director.